Bucky and Maryanne Barber started each of their six children in martial arts at an early age. Their second-oldest, 20-year-old Maycee Barber, was 3 when she began in karate. By 13, she was teaching it to adults at the family’s martial arts academy in Fort Collins, Colorado. Never, though, did they want to see any of their children become professional fighters. But when Maycee was 13 or 14, she told her parents that she wanted to fight in the UFC. It hit both of them hard. The last thing they wanted was to think of their daughter getting punched and kicked in the head. “Her Mom and I weren’t excited, to say the least, when she told us she was going to fight,” Bucky, who serves as his daughter’s manager, told Yahoo Sports in a phone interview. “We got into martial arts for self defense. As a father, you can’t imagine your daughter fighting. But once we got our minds wrapped around the fact that this was what she wanted to do, that she was going to pursue being a fighter regardless of what we thought about it, our entire motivation changed. 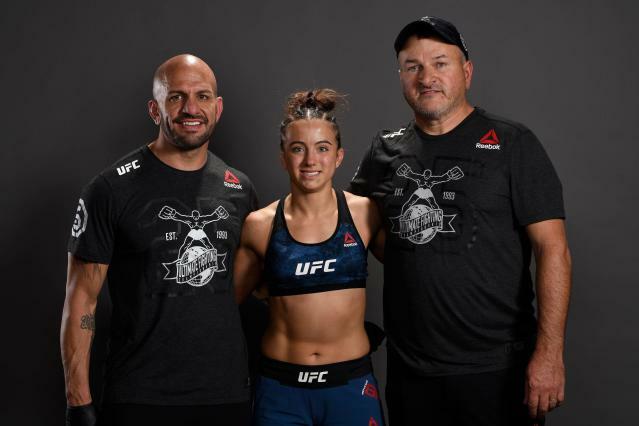 They would drive every other week from Fort Collins to Albuquerque, New Mexico, so she could train with Greg Jackson and Brandon Gibson. They put her with Duane Ludwig and Trevor Wittman. They tried to get Matt Hume, one of the greatest coaches in the sport’s history, to work with her. They put her at Team Alpha Male. They brought her to Ryan Schultz and Matt Pena and Marc Montoya and Izzy Martinez and just about anybody who was anybody in the fight game. Some coaches didn’t like the fact that she wanted to move on and learn from different people, but her father wouldn’t let it bother him. If they were going to do this, they were going to put everything they had into it, even if it meant packing up the family, closing up the business and moving halfway across the country. This is a woman who got to a purple belt in Brazilian Jiu-Jitsu by watching Gracie University’s online video series with her older sister, Emma. Though to hear Maycee tell it, she didn’t so much watch the videos as she let her sister learn what needed to be done and then adapted to it by working on the moves with Emma. Emma would break it down and then Maycee would learn it from her. “My sister is like that book-smart kid,” Maycee said. “She’s freaky like that. She’s just good. I’m the kind of kid who is like, ‘Arrgh, this takes forever. Just show me how to do it and I’ll do it.’ So she would actually watch the videos and take in all the details. That’s how she had to learn: ‘Put your right hand here, your left hand here and do this.’ She’d watch and she would take notes on it as she watched. Maycee’s career has become a family affair. She earned a spot in the UFC in the “Dana White’s Tuesday Night Contender Series” last year, then won her UFC debut in impressive fashion when she stopped Hannah Cifers in the second round on Nov. 10. Bucky and Maryanne, in order to continue to provide elite coaching for the budding prodigy and her 17-year-old brother, Wyatt, closed their martial arts academy and moved to Milwaukee, Wisconsin. Her head coach remains Marc Montoya at Factory X.
Maryanne Barber found a coffee shop for sale online, and they purchased it and it became the new family business. Maycee said she loves to bake and is a coffee addict, so it works well for her. She’ll pitch in and work occasionally and said she loves the banter and back and forth with customers. The move was hardly surprising, because the family had done nearly everything together, and Bucky and Maryanne home-schooled the children so they would be available to work in the martial arts academy. The move, though, came because of her parents’ desire to make certain she was as prepared as possible to survive the rigors of professional fighting. She vowed to become bigger than either former two-division champion Conor McGregor or ex-UFC women’s bantamweight champion Ronda Rousey, who are the biggest attractions in the sport’s history. She’s got a long way to go to get to their level, but is 6-0 and preparing to fight in her second UFC fight on Saturday, when she meets J.J. Aldrich in a flyweight fight in Nashville that is streamed on ESPN+. Maycee set a goal of becoming the youngest champion in UFC history. That mark is currently owned by Jon Jones, who was 23 years, eight months and one day old when he defeated Mauricio “Shogun” Rua in 2011 to become light heavyweight champion. Maycee has a countdown clock on her phone that counts down the time until she’s that age, to remind herself how long she has to get it done. Still, as good as she is, there remains a huge risk in fighting. But Bucky Barber, who was so concerned early on about her decision to fight, has come to feel differently. Yes, he said, there remains a risk of injury, but he sees things from a different perspective now. He said he and his wife were more fearful for her safety in the early days, and that they’ll better be able to deal with a rough fight now than they were when she first broached the idea. He was asked how he’d react if, for as good as she is, she’d come up against someone who was her equal. “You have to recognize in life, there is risk everywhere,” Bucky said. “I look at what Maycee is doing and I see that it is going to give her financial advantage to the point where one day, she’ll probably be off of the freeways and places in traffic where a lot of bad things happen. So if she could put herself into a position where she doesn’t have to go to a job everyday, and maybe this is me just crazy thinking, but maybe it’s safer for her to cram 40 years of work into 10 than it is to actually go [to work] someplace for 40 years and travel on the roads. He said he understands the physical risk that a fight poses, and said it’s why he urges referees to stop fights before someone is injured. He said he’d feel the same way if it was his daughter taking the abuse, not the one doling it out. Maycee is young, and either doesn’t see the risk or prefers not to talk about it. She pointed out that the last word in MMA stands for arts, as she explained why she loves to fight. “It’s a form of art, of personal expression, and so much can be added or taken away or changed,” she said. “It can never be perfect and it can never be recreated. You can never recreate one fight. You can never recreate one sequence. It’s always different and it’s always where there is something to learn. It’s entertaining because every day, your eyes are opened to something new. The fact that you could have a dominant win and still have something you want to change or hope to fix, or if you know you made that move a half-second quicker, the fight would have been over.